Our company can handle small and large property improvement projects for residential and commercial properties across Vermont. As a well-experienced excavation and site work contractor, we can offer you outstanding workmanship and reliable services. Some of the projects that require performing these tough jobs include roads and driveways, landscape development and home and commercial construction. We have in-house personnel ready to take on your project no matter how simple or challenging it may be. Site clearing. Removing all kinds of obstruction is always the first task we do when preparing the project site. This normally involves removal of shrubs and trees. This may also involve teardowns of structures such as old walls or pavements. The work can proceed only when the site has been fully cleared of such obstructions. Grading. In this phase, we ensure proper leveling of slopes by means of rough grading and final grading. We can add topsoil or aggregates during this period to achieve the desired grade for specific areas of the project site. Paving. During this time, we install driveways, walkways, patios, and other paved surfaces that the client needs. We use whatever materials the client demands such as paver blocks, concrete, and natural stones. Excavation and site work are highly demanding and technical jobs that must be handled only by professionals with complete resources. 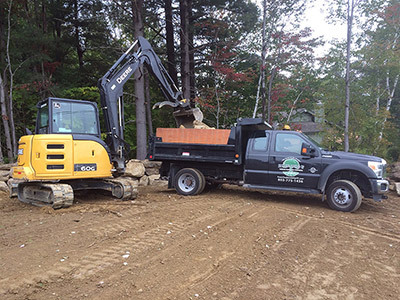 Accordingly, From the Ground Up is among the most trusted landscape construction firms in Vermont, with clients in Manchester, Rutland, Woodstock, and other neighboring locations. We have skilled manpower, heavy-duty equipment, and top-quality materials that make our work hassle free. If you demand only the best results, then we are the company you should trust for all your excavation and site work requirements. Call us today.